Bored at home? Here are some ideas for pranks to do at home. The first 5 prank ideas use common household items that you should be able to find in your home. This prank idea that will leave your victim stuck in the house holding up a bowl of water against the ceiling with a stick. Tell your victim that you want to show them a magic trick - that you will make the water in the bowl disappear. Hand them a stick that reaches the ceiling and then step up your chair or ladder to press the bowl against the ceiling, then guide their stick to press against the bowl. Once your victim has secured the bowl to the ceiling with the stick, you disappear leaving them standing and holding up the bowl. The only way out now is to get wet. That's something you can help them with, of course, by a tickle or a spank ;). This is probably one of the funniest pranks to do at home, if your victim has a good sense of humor and sees the fun in it. Make it snow baby powder indoors from the ceiling fan or any air-conditioning vents you can find in the home. Or make a glitter surprise for your victim. Personally I prefer baby powder as it's more pleasant to have around and vacuum off later. 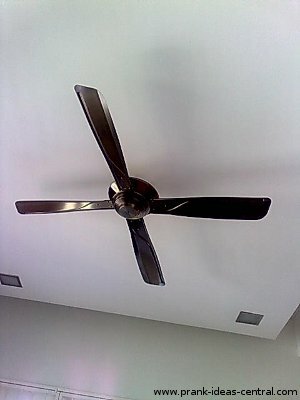 If you're setting up a prank on a ceiling fan, sprinkle your material liberally on the top of the fan's blade while it's off. 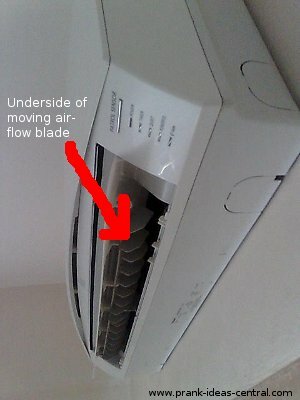 Wipe off any excess powder that falls off from the blades. Then wait for your victim to turn it on. For air-conditioning vents, it's a slightly different story. Remove the vent cover and sprinkle liberally (of course!) in the air duct. If it's a split-conditioner (as shown above), open up the blade that directs airflow, and use a piece of cloth or plastic to make a mini hammock full of powder that you can tie to the inside. Make sure it's not tied to the moving parts though. When it's turned on, the wind flow will blow on the powder in the hammock and create an avalanche of powder. Don't own up to the prank if you can help it, though, since this is probably one of the messier pranks to do at home. In this prank idea, take out the batteries of the remote control in the house. 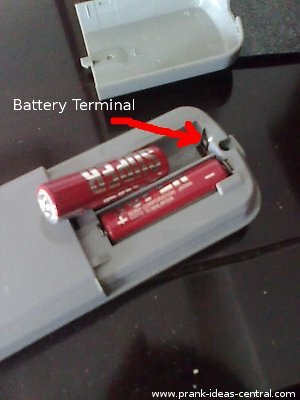 Stick a piece of transparent tape over the battery terminals, then put batteries in again. This should cut off the power supply from the batteries to the control, even when the batteries are replaced. This is of the simplest pranks to do at home, if you have someone who's electronics illiterate. If you have a hallway leading out to a room at home, this is a one of the best trap pranks to do at home. As in the video, attach saran wrap to the hallway at your victim's head level. You can tape the ends to the wall for a good stick. Make sure the hallway is darker than the room, though, so that there won't be any shine on the wrap that your victim can see. Of course, ideally the prank should be played in the dark, but that would be too easy, wouldn't it? For this prank to work, you'll need some superglue and your victim's flip-flops. Apply the superglue to the bottom of the shoe and then glue it to the floor where you found it. When your victim tries to slip them on and walk, chances are they'll lose some balance and maybe tip over. As a precaution, make sure there are no sharp objects around that your victim can fall on. Purchase a toy spider and hang it in front of your victim's room door, the bigger and more realistic, the better. When they walk out, they are going to get a shock of their lives. This is a great prank to play on sisters or brothers. Tape record animal noises, by a mouse, for example. Get a fake animal of your choice that looks fairly realistic at first glance, then plant it in the ceiling or under the bed with the appropriate noises playing from a tape recorder or mp3 player. Call your victim along for the 'hunt'. Pretend to struggle a little at the site of the 'hunt' and throw fake animal at your victim. Get a balloon and fill it with water, then place it in your doorstep. When the victim walks through, SPLASH! Put peanut butter on the bottom of doorknobs or dresser knobs and when your victim tries to open it it will get a bit sticky! First put a mask in your fridge.Then when your victim is hungry he or she will open the fridge door then he or she will have a scare and scream!!!! !